from An epitome of Mr. John Speed's Theatre of the empire of Great Britain, and of his Prospect of the most famous parts of the world : in this new edition are added, the descriptions of His Majesties dominions abroad, viz. New England, New York, ... Carolina, Florida, ... Virginia, Maryland, ... Jamaica, Barbados, ... as also the empire of the Great Mogol, with the rest of the East Indies, ... the empire of Russia, with their respective descriptions. 1 : 7350000 Lucas, Fielding Jr. Shell Highway Map Northeastern Section of the United States. Virginia, Marylandia et Carolina in America septentrionali Britannorum industria excultae / repraesentatae à Ioh. Bapt. Homann, S.C.M. Geog. 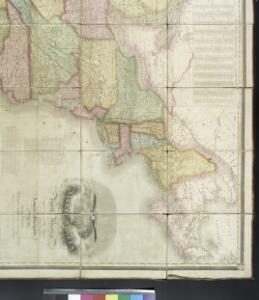 Composite: Upper, Lower Canada; United States &c.
Copy of a map attached to Govr. Colden's History of the Five Indian Natio[ns] : printed in London, A.D. MDCCXLVII.